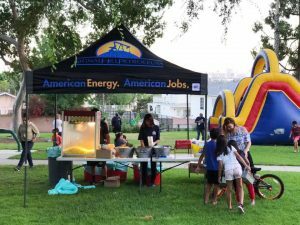 The Grunion featured an article about summer activities in the Long Beach area. SHP was hilighted in the article for being the sponsor for Long Beach Movies in the Park. Continue reading below for more details. SHP has sponsored the Movies in the Park series for the last 13 years. Like every other beach city in the world, summer is a huge season for Long Beach. For many years, the city put together something called the International Sea Festival. It never was a festival in the regular sense —it was more of a name to put other events and festivals under. Call it a marketing ploy before there were marketing ploys. It was designed to let the world know about all the on, in and near water reasons to come to Long Beach in the summer. That included everything from speed boat races to building sand castles. The Sea Festival survived wars, changing administrations, changing tastes and more. But it couldn’t survive, at least as a city-organized effort, the Great Recession. Beginning in 2009, city budgets in all departments shrank precipitously. Priorities put promotion of summer festivals and the like at the bottom of the list. For a couple of years, a nonprofit created by Grand Prix of Long Beach founder Chris Pook took on the task. The Sea Festival Association had some successes, but as the Great Recession dragged on, city officials started demanding full cost recovery — no discounts on permit fees. Those discounts were about the only thing Pook and his partners had to sell. By 2012, the Sea Festival Association had closed its doors. The Sea Festival remained in name only. But there still were many things going on in Long Beach during the summer, and not all of them were by the water. Given the still-tight economic times, it made sense to promote the free or almost free recreation available to Long Beach residents. Those things include a Movies in the Park series sponsored by Signal Hill Petroleum that takes blow-up big screens to parks to show almost-new movies along with free popcorn, bounce houses and more for the children. It is an expansion of the very successful Movies on the Beach started by the late Fred Khammar. A new movie series this year is part of the city’s Be SAFE program offering extended youth programming at some parks. The Port of Long Beach will sponsor 11 movies through the summer there. Long Beach residents love their music al fresco, with multiple concert series around town as well as the Long Beach Community Band playing at parks, sometimes before movies. An expanded community concert budget this summer will mean more music, Scott said. Then there are the big festivals and contests — the Jazz Festival, the Cajun Festival, the Tiki Festival, Dragon Boat Races, Beach Soccer, etc. While most of those parties require an admission fee, the certainly qualify as summer recreation, and they’ve made it onto the 100 Days of Summer list. City staff members still were at work this week to get the 100 Days calendar up on the website, but it is expected to be functional by Memorial Day. The calendar is at www.100daysofsummer.org.